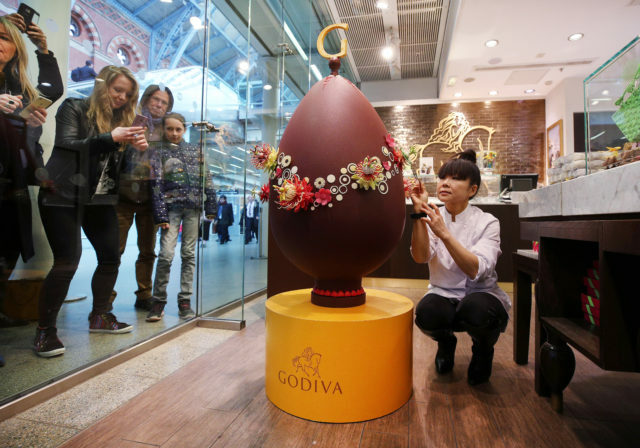 Luxury Belgian chocolatier, Godiva, has today unveiled its most expensive and extravagant Easter egg to date, a decadent £10,000 egg made from 65kg of Godiva dark Belgian chocolate. The egg, which measures over a metre in height and half a metre in width, was created by Godiva’s Creative Development Chef, Cherish Finden, to celebrate Easter. The handcrafted egg, unveiled by Cherish at Godiva’s St Pancras International boutique, took the renowned pastry guru and her team of three assistant chefs over 200 hours to create. The large, handcrafted Atelier egg will be available to view exclusively at Godiva’s St Pancras International boutique until Easter Sunday. The show-stopper, made entirely from delicious Belgian chocolate, is inspired by the colourful blooms of spring. Hand-adorned with life-like passion flowers, vibrant fuchsia chocolate petals and eye-catching hearts; it’s crowned with the iconic Godiva “G”. The egg is not only impressive in size, but a visual masterpiece too.